Adrian Hunter, the son of a duke's daughter and a black abolitionist, is determined to do whatever his family needs—even posing as a valet to gather information. But his mission spirals out of control when he’s accused of dastardly intentions and is forced to marry a woman he’s barely had time to flirt with. Camilla Worth has always dreamed of getting married, but a marriage where a pistol substitutes for “I do” is not the relationship she hoped for. Her unwilling groom insists they need to seek an annulment, and she’s not cruel enough to ruin a man’s life just because she yearns for one person to care about her. As Camilla and Adrian work to prove their marriage wasn’t consensual, they become first allies, then friends. But the closer they grow, the more Camilla’s heart aches. If they consummate the marriage, he’ll be stuck with her forever. 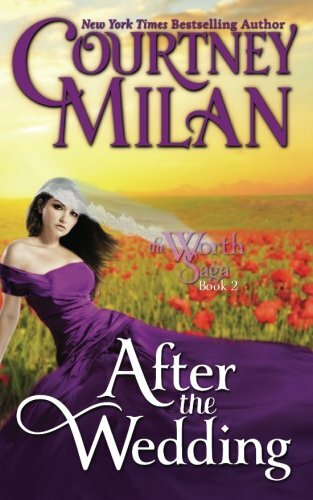 The only way to show that she cares is to make sure he can walk away for good… After the Wedding is the second full-length book in the Worth Saga. It is preceded by Once upon a Marquess, the first full-length book. The series books stand alone, but those who wish to read in order may want to start there. Also available in the series are Her Every Wish, a side-novella, and The Pursuit Of..., which is something of a prequel. epaulettes (Grade: A+) I love Courtney Milan, but she truly outdid herself here. This is an optimistic book about marginalized people who choose to see & make good in the world despite what it throws at them & I loved each and every moment. I especially loved Camilla's journey, learning to forgive herself for mistakes she made as a child, & to BELIEVE that those mistakes do not define her, that she deserves to be happy & chosen & loved. I shed so many tears for her, and those tears cleansed my skin & watered my crops.